It must be said that the very term tramway is now a native Russian word. This term includes everything related with city street-running railway: tracks, vehicles and network. Linguists cannot agree where exactly this word came from (although the English origin is not discussed) and how it had replaced the descriptive gorodskaya zheleznaya doroga ("city railway"), so there is a haze of magic even in the name. Yet in general this is the same transport as the American"streetcar", "trolley", or "LRT" - names make no difference. 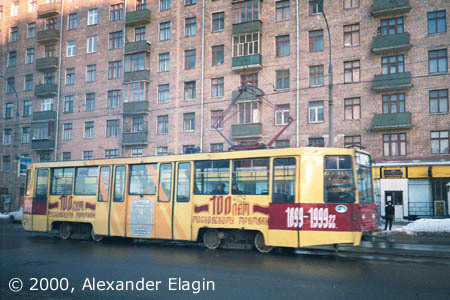 Moscow has also the world's largest trolleybus network. Trolleybus is also a native Russian word now, and it means the transport mode which is also called "trackless trolley" by Americans. There are plans to expand the trolleybus network even wider, but the plans are permanently delayed and nothing has been fulfilled yet - at least, in Moscow. 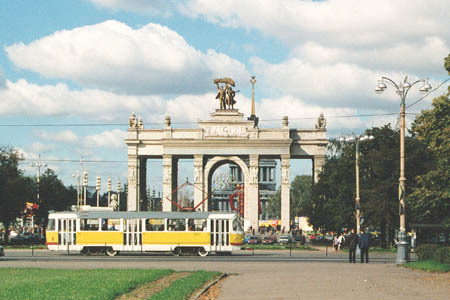 But now three cities in the suburbs of Moscow - Khimki, Vidnoye and Podolsk - have constructed their own trolleybus lines. The system of Khimki began service in 1997, and in Vidnoye and Podolsk the first lines were constructed in 2000-2001. 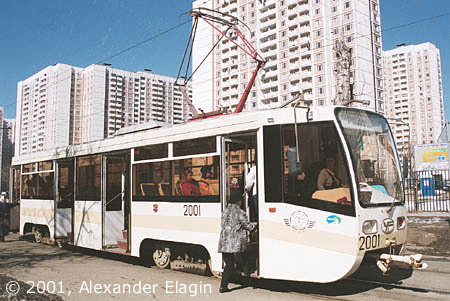 One line from Khimki in 2001 has crossed the borders of Moscow, being the first trolleybus line in Moscow to come to the city "from the outside". Some technical detail: all lines have two tracks (except for termini) with a single exception - a section of interlaced tracks in a narrow tunnel near Kurskiy railway station. Track gauge is standard for the Russian railways - 1524 mm (5 feet). Tramcars are powered from overhead wires with DC 550 Volts. Currently the fleet consists mainly of tramcars Tatra T3, 71-608K (aka KTM-8), 71-608KM (aka KTM-8M) and the newest model 71-619K (aka KTM-19). Butyrskiy Park 1899 - 1966 (freight) Offices etc. For more information, please visit the Moscow Tramway Site. And finally - a few words about fare. 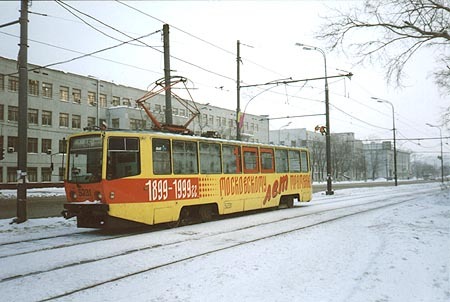 It does not depend on distance and now is 13 roubles (circa 0,4 €) for a single trip on any surface municipal transport - tramway, trolleybus or bus - in city limits. There are no transfer tickets or "tourist" tickets (unfortunately). Since October 2002, monthly tickets for surface transport do not depend on the kind of transport you use. Now the only flavour of such tickets enables its owner to make an unlimited number of trips on any municipal bus/trolleybus/tram for one calendar month; it costs 450 roubles. The most convenient (and the most expensive - 900 roubles) is a so called yediniy ("unified", "general") pass. It is valid for 70 Metro rides and unlimited number of tram/trolleybus/bus rides for one calendar month. Such tickets can be obtained at Metro stations and special kiosks from 18th to 5th of each month, e.g. you can buy the May pass from April 18 to May 5. It must be noted that the fare system in Moscow is far from excellence; for example, the vast network of commuter railways in Moscow has its own fare system and tickets. The infamous monorail line (still not opened for a regular service by the date, two years behind the schedule) has its own tickets and fare system: single-trip ticket costs 50 roubles (!). My opinion is that Moscow badly needs a widely accepted time/zone fare system instead of a hopelessly archaic current one inherited from long gone years. Starting from 29 April 2006, all trams, buses and trolleybuses in Moscow have been equipped with so called ASKP - automatic fare collection system, consisting of a single turnstile with a magnetic card validator. Boarding is now allowed only through the first door. Tickets with a magnetic stripe (there are a few variations depending on a number of allowed trips, namely 1, 2, 5, 10 and 20 trips) can be obtained at kiosks or from a driver, but the latter possibility is more expensive. Drivers sell only single-trip tickets. Unfortunately, the similar Metro tickets cannot be used, except for the above mentioned yediniy pass. The system has gained a highly negative reputation among the commuters because it simply cannot cope with rush hours passenger flow, leading to very long delays at stops. However, the officials are quite satisfied with the results because the fare collection has really increased significally. The surface heavy rail network in Moscow with its nine terminals and many lesser stations plays a major role in transportation, but mostly serves the commuters from the neighbourhoods of Moscow. It could be further improved to better suit the transportation needs of the city itself, but again it depends on uneasy mutual relations of the railway administration and city officials on financial matters which are as usual more difficult to solve than technical ones. The heavy railway network, of course, has its own independent fare system and the city tickets/passes are not valid on trains. There are also lots of so called marshrutka jitney buses here in Moscow - mini-vans with route numbers usually copied from municipal routes that they follow. They tend to grab passengers from municipal transport, leaving the latter in even worse financial state than it would be otherwise. No passes are valid on such privately owned 'routies', the fare is different on different routes and is collected by a driver himself. I use to think of such 'public transport' to be a property of some third-world country; it is not what Moscow deserves. However it looks like the city administration is quite satisfied with status quo for unknown (but guessable) reasons.